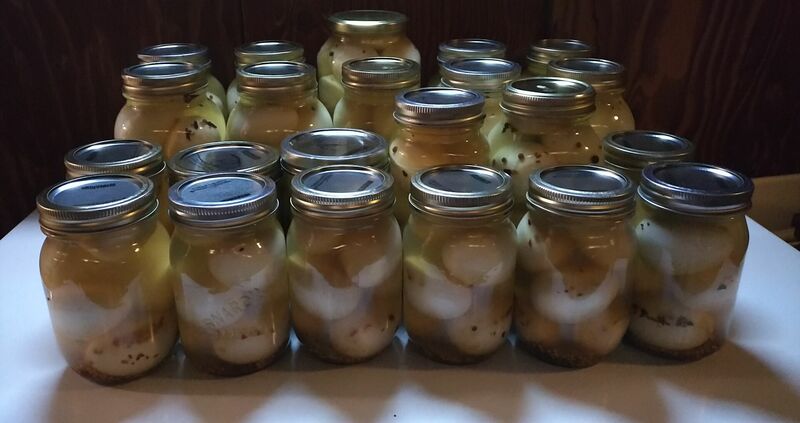 This past weekend, I made more pickled eggs. A lot of them. In July 2018, I described my then-recent experiences over several sessions making large numbers of eggs in anticipation of a flea market at which I then sold my pickled eggs. On the point of being a bit too enthusiastic, I decided that while I am pleased with the overall production, given the personal reserve I already had had on hand, the production of the equivalent of one of the double batches — the last round of six dozen eggs purchased — should have been foregone. I am likely to be asked again relatively soon to make more pickled eggs for my good customer, during which I would be able to make more pickled eggs for my personal reserve; in any case, I would at least keep the torn eggs from such a production for my personal reserve. Earlier this year, I had came to the conclusion that for large batches of eggs, a tear rate of roughly one egg per dozen is acceptable, since I just put the torn eggs aside in a separate bowl, then bottle them together, which I keep for my own personal reserve. This weekend, I had a good experience with my tear rate: There were only 11 eggs over the 19 dozen eggs with tears — in fact, only about six had tears, while a further five were merely deformed from shells which cracked during boiling.